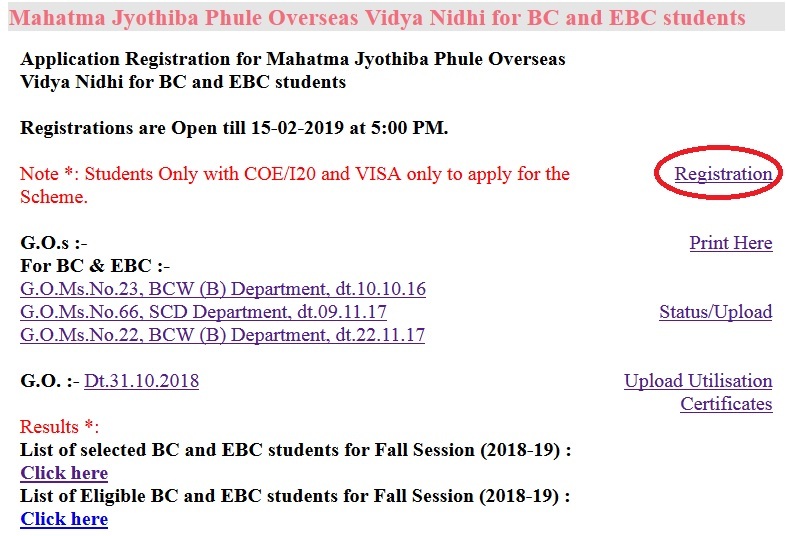 Mahatma Jyothiba Phule Overseas Vidya Nidhi for BC and EBC students Registrations are Open till 15-02-2019 at 5:00 PM. ** The maximum age under the scheme shall not exceed 35 years as on 1st July of the year of advertisement, as per SC/ST overseas scheme. ** The students who have not applied for 1st installment/1st year shall be eligible for 2nd installment/2nd year under the Scheme. ** Family Income shall be less than Rs.5.00 Lakhs per annum from all sources. This enhanced income limit will apply only for Overseas Scholarship scheme. Just follow the below steps to register for Mahatma Jyothiba Phule Overseas Vidya Nidhi For BC & EBC Students 2018-19. ** 5% of 300 students i.e., 15 seats shall be reserved/considered for Economically Backward Classes students. ** The student shall be eligible for an educational loan from any nationalized bank or any other bank, the Department may issue a letter “to whom so ever concerned” informing the selection of candidates along with financial assistance details so that it will be helpful for the students to obtain Bank loan for any additional amount required. ** Relaxations of 60% minimum marks in degree/PG is considering only, subject to the candidate gets adequate score in eligibility test such as GRE/GMAT/ IELSTS/TOEFL/PTE and gets unconditional admission in the abroad Universities/Institutions in case if the registrations are not up to the expected levels within the Budget allocated and being done only on case to case basis by the Government. ** One way economy class Air ticket fare will be paid for a maximum of Rs. 50,000/- (Rupees Fifty thousand only) or actual charges whichever is less for any country. Actual Visa Charges are also paid separately in addition to the scheme amount of Rs.20.00 lakhs. When I fill my overseas scholarship application in ePass Telangana, ID is generated automatically but after submitting the whole documents and details, the status is showing ‘records not found’.